Image from On Kawara's Today series on view at the Guggenheim Museum, New York City. The object of repetition deceives because it repeats but is never redundant. It remains somewhere between uniqueness and duplication, uncertain of either but certain of itself. On Kawara (1933-2014) was a Japanese conceptual artist who understood the unique value of repetition and whose creative oeuvre - particularly his Date Paintings, I Am Still Alive, and I Woke Up At series - illustrates the repetitious act, exposing characteristics of both difference and sameness but refusing to commit to either. It is through the unique language of repetition that his work studies the event, in itself, of copying, and exposes its poetry and lyricism in a language of repetition, which draws on the philosophical work of Walter Benjamin, Gilles Deleuze, and Jacques Derrida. Benjamin, in his aim to define the ontology of reproducible media, described uniqueness in art as "identical to its embeddedness in the context of tradition." Traditions are events taking place through temporo-spatial uniqueness, tethered to acts of a particular time and space. The mechanically repetitious act around such works, he argued, extracts the object's aura, producing through duplication an object without authenticity. However, reproducibility itself is not the act that destroys the object's uniqueness, rather it is the indifferent mechanical apparatus that endlessly produces the copies. Kawara's approach illustrates reproducibility without the indifferent, automatic mechanical apparatus. His Date Paintings (1965-2014), commonly known as the Today series, were meticulously painted by hand, requiring at times an entire day to complete. The date he painted corresponded to the date in which he painted the work, and aspects of the location are indicated by language. Though the act was excessively repetitive b there are nearly 3000 paintings in this series that ended only with his death - it reconstitutes the temporo-spatial normativity of the traditional act. For Kawara, repetition indicates duration, marking days of wakefulness and action in his life, as well as difference. Each painting represents a unique time, place, and object. The repetitious act and particularly the sameness of each painting draw attention to their difference. Difference is entirely represented by the unique object of creation. The relationship between repetition and uniqueness was explored in multiple ways in his work. From 1968-1979, Kawara created the I Got Up series, which consisted of nearly 1500 postcards sent to friends and family around the world indicating the exact time and location in which he awoke. The postcards were mass-produced and purchased and the wake-up time was hand-stamped on each card, further combining elements of uniqueness and reproduction in this repetitive act. I Am Still Alive utilized the medium of the telegram, creating a mechanically stamped document indicating the time, location, and message of his physical presence in the world which were sent to friends and family around the world from 1970-2000. 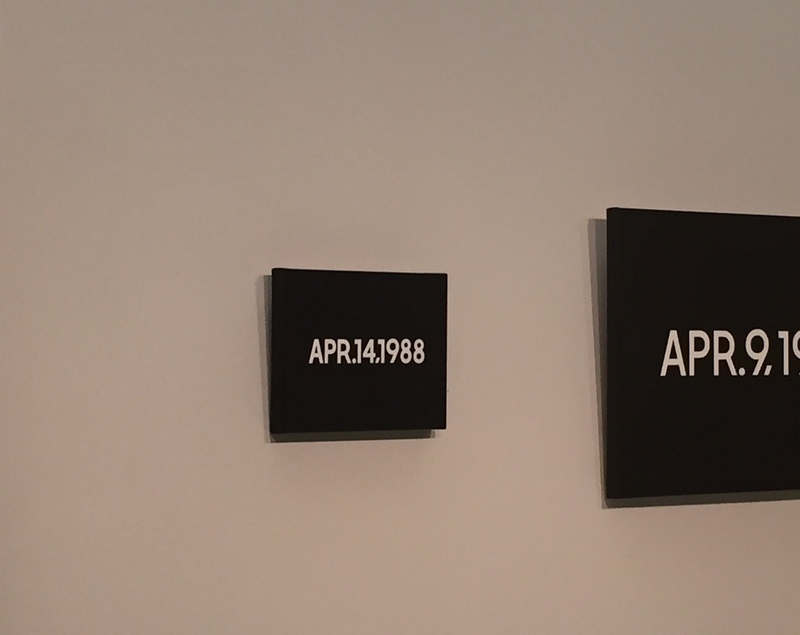 Despite the controlled conditions surrounding these works, Kawara's series illustrate unique objects produced through equally unique acts of individual time-space relationships. As such, repetition allows differentiation to emerge. This echoes Deleuze's concept of repetition. He wrote, "Difference is this state in which determination takes the form of unilateral distinction. We must therefore say that difference is made, or makes itself." With this in mind, difference is not merely dependent on its relationship between two things, rather is itself emergent and processual. In Kawara's work it is invited and maintained through repetition. The verb "to differ" [différer] seems to differ from itself. On the one hand, it indicates difference as distinction, inequality, or discernibility; on the other, it expresses the interposition of delay, the interval of a spacing and temporalizing that puts off until blaterb what is presently denied, the possible that is presently impossible. The same can be said of Kawara's work. A single object and act of repetition seem to differ from themselves. On the one hand, his work shows distinction and inequality, or difference, between each object; and on the other, it demonstrates the delay of the act itself, or the deferral of its completion. In other words, today the act gains meaning through its placement in the lineage of a series of repeated acts. While each individual painting, telegram, or postcard represents the moment (time and place) of the origin of each act, the delivery mechanism of each fulfills a separate act. The works thus fulfill Derrida's second meaning of delay: both the delayed receipt of each work and the cyclical nature of each series encourage this second function. Creating these works throughout his life, Kawarabs repetitious acts depended on the interplay between Derrida's two meanings, which remained inseparable in each work. Repetition serves as an anchor from which difference emerges and achieves multiple meanings while yielding additional possibilities for the marks of difference, especially in the distinctions between single characters or colors between paintings, or the month or year on a postcard, or the timestamp of a telegram. In addition, in Kawara's work difference achieves the meaning of distinction as well as delay, never fully reaching one meaning, and in the process maintaining its own singularity. In this sense, repetition seems particularly significant through its dependency on Kawara's individual acts: each individual work and each series in their entirety denote his existence in exact terms. This promotes the emergent eventness described by Deleuze and follows Benjamin's notion of uniqueness. However, one could argue that Kawara's work highlights the characteristics of repetition that may otherwise remain discreet. Repetition in itself reveals a singularity if only through its separateness from its counterparts. It constructs a language through and with repetition, which invokes Derrida's notion of iteration, which generally states that every word that can be repeated is first iterative but also is inevitably reiterative. With this in mind, everything that can be shared, in any manner, is subject to repetition, with or without mechanical or automatic means. This sets an undertone for repetition to both exist and be fully understood. Excessive repetition extracts this understanding, and through it brings out meaning through difference. A word repeated gains meaning on its third, fourth, and fifth reiteration. Redundancy could not possibly exist within this scheme as the fifth meaning depends on the previous four reiterations, unlike the fourth, which only depends on three. Likewise, a repetitive action is subject to the temporo-spatial context of the event itself. Future events are understood in relation to their own parameters, as well as those prior to them and those that will follow. Such is the language of repetition, which does not promote meaningless redundancy, rather reinforces or changes meaning through its repeated use. On Kawara's work uniquely placed physical action besides the lasting object with a mix of handmade and mechanically produced forms, framing differences with each repeated act. Repetition as a creative tool produces not merely copies, rather multiple originals with noticeable differences and similarities. The cycle of repetition is an emergent act, allowing difference to relay both distinction and delay. The latter promises another difference, another original, to add to the collection. The language of repetition may be especially meaningful today in a highly automated, digital, and easily reproducible atmosphere of actions, exchange, and object creation. Like Kawara's work, they mark unique dates, indicate action, and furnish proof of life. Walter Benjamin, "The Work of Art in the Age of Its Mechanical Reproducibility," in Walter Benjamin: Selected Writings, Volume 3 1935-1938, trans. Edmund Jephcott, eds, Howard Eiland and Michael W. Jennings (Cambridge: Harvard University Press, 2002), 105. Gilles Deleuze, Difference and Repetition, trans. Paul Patton (New York: Columbia University Press, 1994), 28. Jacques Derrida's essay originally appeared in the Bulletin de la Société française de philosophie, LXII, No. 3 (JulybSeptember, 1968), 73-101. These remarks were delivered as a lecture at a meeting of the Société at the Sorbonne on January 27, 1968. The essay was reprinted in Théorie dbensemble, a collection of essays by Derrida and others, published by Editions Seuil in 1968. It was reprinted here by Northwestern University Press in 1988, 83-96. Jacques Derrida, "Signature, Event, Context" in Glyph 1, trans. Samuel Weber and Jeffrey Mehlman (Baltimore: Johns Hopkins University Press, 1977). Natasha Chuk is a New York City-based writer, scholar, and independent curator whose interests focus on the intersections between technology, interface, and perceptions of and within media objects, particularly the ways visibility is created, controlled, and negotiated.